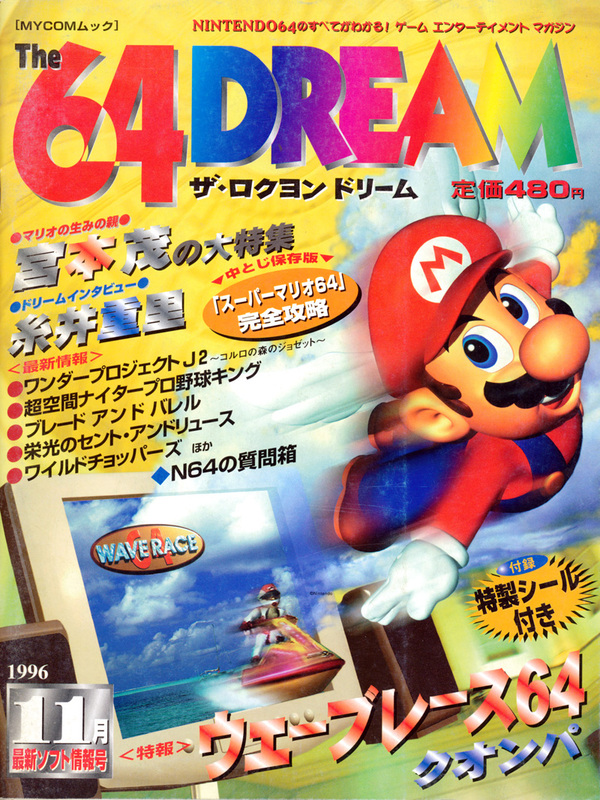 The 64DREAM – November 1996 | Yomuka! This is the first ever official issue of The 64DREAM (currently “Nindori”), but Volume #2 after an initial unofficial release in June. It treats us with a treasure trove of juicy insights into the creation of Earthbound 64. Itoi’s team had an impressive amount of the game finished even by 1996, which really accentuates the troubles they went through and how looong it had dragged on. (The editors from this interview got the impression it would be on sale by summer 1997.) It’s amazing to think about how the project was scrapped even after taking years and years of their time! In interviews and statements over the past five years or so, it seems clear that Itoi thoroughly enjoyed his game-making experiences but sees it as a closed chapter of his life. We can see this in interviews like this one from 2009. 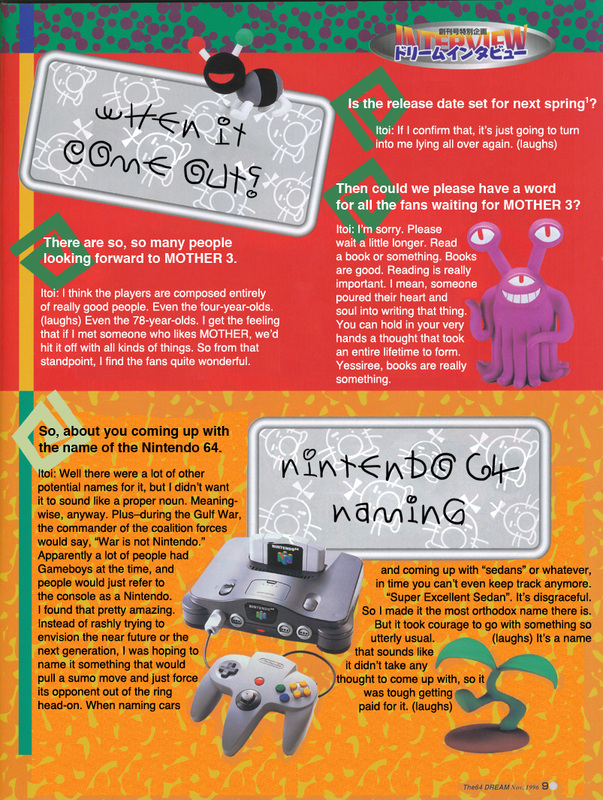 The fact that this interview takes place in the early stages of MOTHER 3 development means the game was still in the process of being programmed for the Nintendo 64DD. A Mr. Saturn spinoff game!? This issue has some of the best and 90’s-est layouts I’ve ever seen, so to preserve this, I edited the page scans to allow you to read the article as-is. Just click on each page to enlarge the image. Note 1. This would be Spring 1997. Looking back, you’d think there’s not a chance of completing it that quickly, but at the time of this interview, that was the pace they were going at. 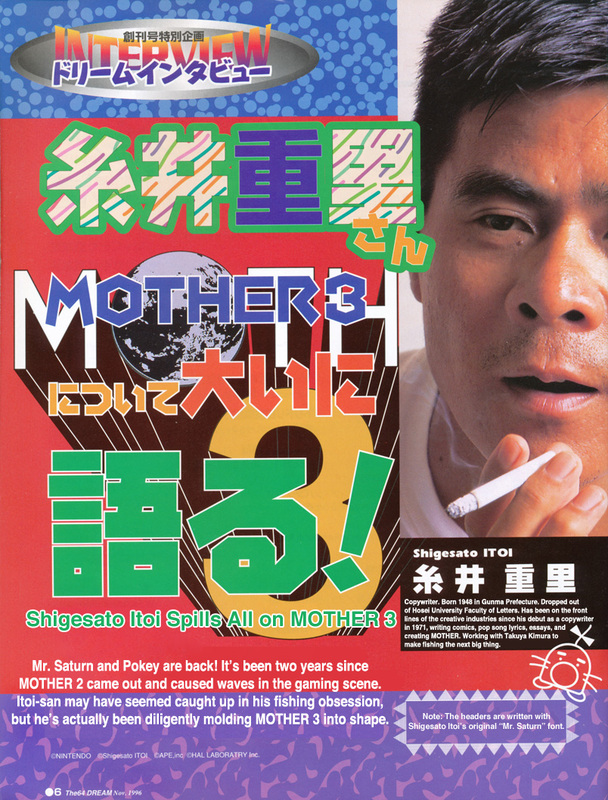 By the time Spring ’97 rolled around, it was obvious to fans that they’d need to prepare for the inevitable–that it would likely take even longer than the delay of MOTHER 2. Little did they know. Note 2. I’m curious about what this weird ad was. 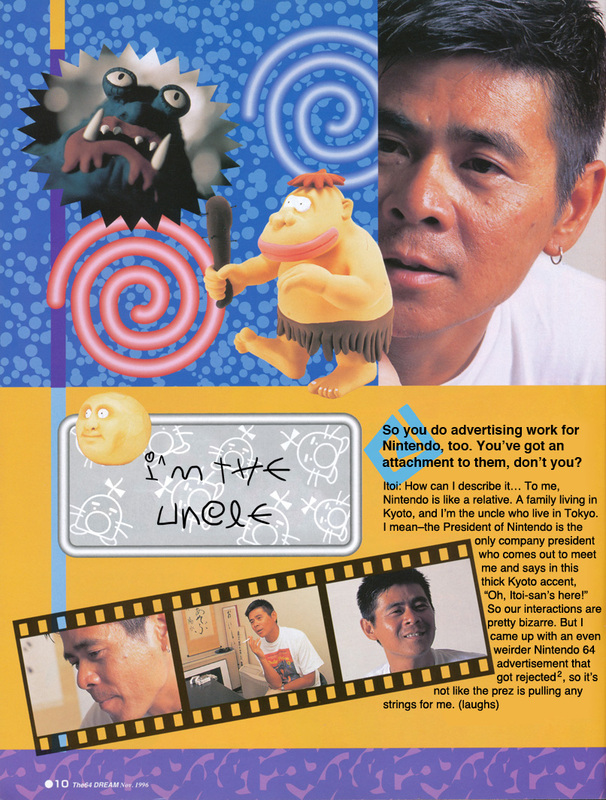 The Japanese N64 ads ended up being extremely plain, which fueled a lot of criticism of Nintendo commercials. Wonder how his would have been! Note 3. This is probably Cabbage. Note 4. This is referring to Itoi Shigesato Bass Fishing No. 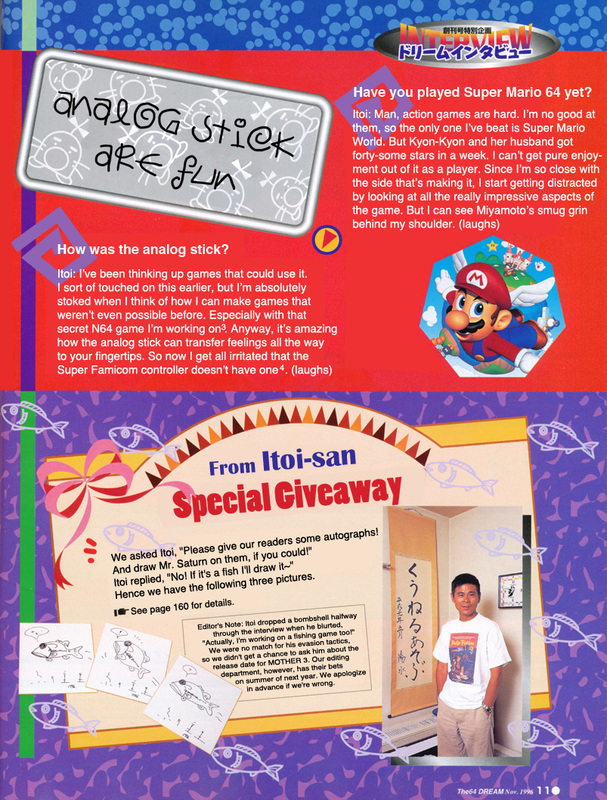 1 for the Super Nintendo which was scheduled for release February 1997, three months after this interview. I didn’t know Itoi helped name the Nintendo 64. I wonder if the idea that could make the battle system its own game is referring to the rhythm element that was added. There have certainly been a lot of tapping games since the time of this interview. It is interesting to see how much of the “old” MOTHER 3, such as the inclusion of Mr. Saturn and Pokey, carried over into the final GBA release. In the end, the game found its way back to the 2D envisioned from the start. Oh yeah, the rhythm tapping! Good point! Wow! What an interview. Thanks for translating it and sharing it here 🙂 Itoi’s quite a bright guy, isn’t it? Although I can understand why he’s no longer interested in making games, esp. given the time he spent making the three Mother games, I can’t help but hope he’ll reconsider at some point. This industry needs games like the ones he produces. Really enjoyed this translation! I love these. His answer to the theme question strikes me as odd. Saying he doesn’t think about themes is one thing, but saying they aren’t present is another. The Mother games have quirky elements, sure, but they’re still pretty conventional in terms of story. I agree. I can see some pretty solid themes in the MOTHER series. Especially when you name your video game MOTHER in order to specifically give it a maternal feel. Maybe he wanted to encourage people to find their own interpretations? 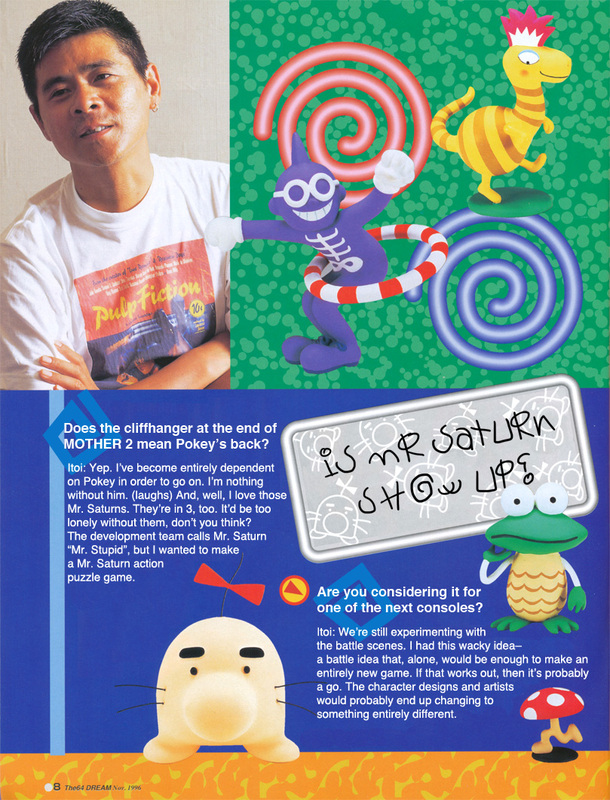 I agree that it’s patently ridiculous that Itoi wrote these games without any themes. I’ve never played the original MOTHER, but 2 and 3 can be pretty profound. 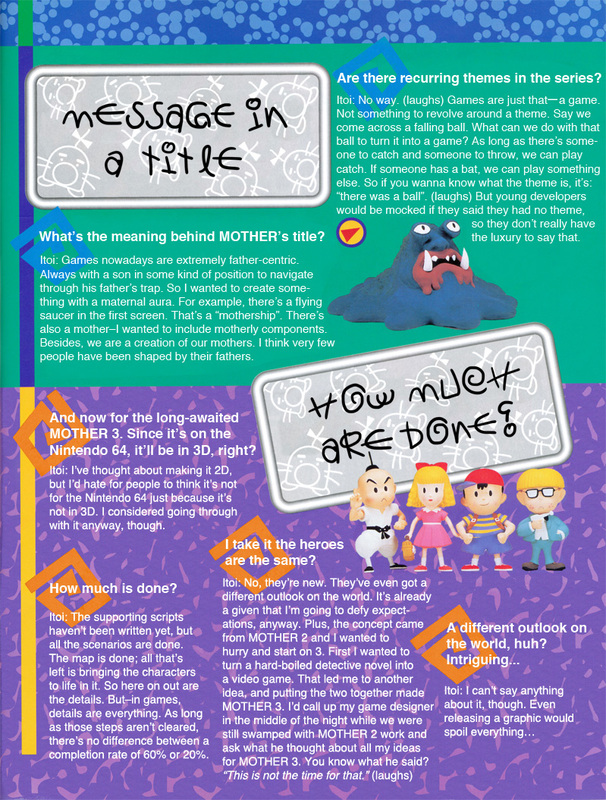 Interesting read about MOTHER 3 of the past, as always! Now we can finally point the finger to who named the Nintendo 64, and we now know how far in the game engine was developed. I wonder what he thought about the name Nintendo Ultra 64 too? No, but I’m in the middle of working with someone who owns these magazines, so hopefully I will have the images and scans of all or most of them before too long. I see, well hopefully we’ll see them soon.